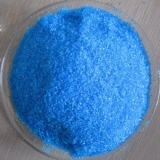 China Copper Sulphate Pentahydrate Suppliers, China Copper Sulphate Pentahydrate Manufacturers. Copper sulphate, also known as cupric sulphate, or copper sulfate, is the inorganic compound with the chemical formula CuSO4(H2O)x, where x can range from 0 to 5. The pentahydrate (x = 5) is the most common form. Older names for this compound include blue vitriol, bluestone, vitriol of copper, and Roman vitriol. The pentahydrate (CuSO4·5H2O), the most commonly encountered salt, is bright blue. It exothermically dissolves in water to give the aquo complex [Cu(H2O)6]2+, which has octahedral molecular geometry. The structure of the solid pentahydrate reveals a polymeric structure wherein copper is again octahedral but bound to four water ligands. The Cu(II)(H2O)4 centers are interconnected by sulfate anions to form chains. Anhydrous copper sulfate is a white powder.